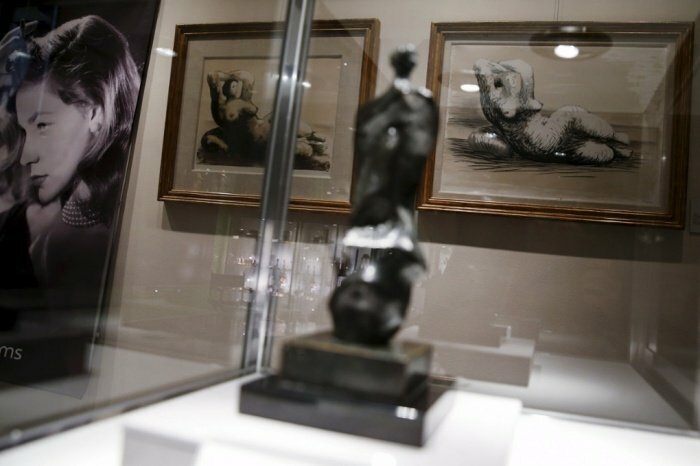 Lauren Bacall’s collection of art, jewellery, furniture and clothing has fetched $3.64 million at two-day Bonhams auction in New York. A hand-colored etching of an American white pelican by John James Audubon sold for $173,000 – three times more than was expected, according to auction house Bonhams. A granite games table from the home Lauren Bacall shared in Los Angeles with her husband Humphrey Bogart sold for $26,250. Lauren Bacall died in August 2014 at the age of 89. The New York home in which the star died, in the Dakota building where John Lennon was shot, is on the market for $26 million. Lauren Bacall’s Tiffany necklace, a brass Japanese tea set and sculptures by Henry Moore were among other lots to be sold on March 31 and April 1. Bonhams’ vice president Jon King said the “extremely personal” collection “truly reflected Lauren Bacall’s formidable collecting sense and uniquely intuitive style”. Proceeds from the auction will go to Lauren Bacall’s three children: Stephen and Leslie, the son and daughter she had with Humphrey Bogart, and Sam, the son she had with second husband Jason Robards.